Remember to use CTRL + F to find what you want quickly! Interlopers.net's Compile Log Checker - Use this to check compiles before asking for help. The TF2 Mappers' Encyclopedia - If you're interested in mapping for tf2 check this out. Hammer Hotkey Page ( Full List ) - Giant list of useful time saving hotkeys for hammer editor. Project Vide - A program that mimics the abilities of Gcfscape, In game particle editor, Entspy, Pakrat, and also comes with a few other neat features, the purpose of Project Vide is to keep all your most used programs in one. The major difference is that Terenteller recreated all of these things and has improved on most if not all the things included in Project Vide. Project Video supports Windows and Linux. Do NOT use Hollow, hollowing can create off grid shapes, and is not meant for big shapes. Hollowing is not a good practice. Do NOT decompile maps and steal content, you will be shunned from all communities no matter what game / mod. Please do decompile maps and learn from other people's techniques. Make sure you give credit where necessary when the map is released. Save often, after every 5 to 10 compiles rename your map, ex: mapname_001 to mapname_002, this is good incase your vmf and vmx goes corrupt you will at least have some sort of thing to build back up from. | HL2:DM Entities | (Nothing else listed since using anything from hl2 will work on HL2:DM as well). 1. Open the start menu. Click the "run" button. Enter "regedit", without the quotes. 2. On the tree view at left, click on "HKEY_CURRENT_USER". Go to Software, Valve, Hammer, 3D Views. 3. Right click "BackPlane". Click "Modify…" and change the base to decimal. 4. Enter the value you want to change the back plane to, and click OK. Done! 1. Open the start menu. In the search bar, enter "regedit". Follow the instructions for XP from step 2. Anything in red. is very important. render_animated_sprites - This tells it to use a sprite/ particle material. Cull random - This kills particles after some time. Alpha Fade & Decay - This sets the alpha and time that it takes for particles to fade away. Movement basic - The most important one here! Without this particles won't form! This tells it to move somewhere. Rotation basic - tells it to move in random ways. It's not noticeable, but it makes it less repetitive. Radius scale - Sets size of particles spawned. Lifetime random - This gives each particle a lifetime. Without this, you will not see particles! Set the lifetime max to 15. Color random - Sets the color of your particles! Without this you get ugly white particles! Position within [box or sphere] random - Gives your particles a place to spawn in. The size corresponds to hammer units, so a max size of 512 512 512 is 512 units on the X Y and Z axis in hammer. Don't mess with the min size. Sequence random - Use if your sprite/particle has more than one sequence. Set the max sequence to whatever the number of sequences the particle has. Emit Instantaneously - Tells the particles to immediately start spawning. You can set this to slowly start in. I'll take it from the top. My 7800GTX exploded so it was replaced by an 8800GTS by BFG. Then after i installed the drivers etc i went to run faceposer, but just as it were about to load the 3D screen… it crashed and i get the dreaded error reporting screen. When i looked at the crash information it looked like shaderapidx9.dll was causing it. I tried a ton of things to fix it. I searched on the google machine and many other people are having this problem. Here are some things that people including me tried but didn't work. It seemed some things worked for some people and others didn't. Mainly changing back to their old graphics cards. So what i done is this. Now, look for a file called "Dxsupport". Double-click it, if it asks you what program to open it with, choose notepad. If you've done that right it should say "DO NOT EDIT" at the top of the page. Now, where it says "DefaultRes", it would have either a 3 didgit number of a 4 didgit number, depending on how good your card is. Mine is 1280.
now you need to go into your graphics control panel and change your resolution to the one stated above. Here are some examples. Mine would be 1180 - 1180 by 962. Once you've set it to the resolution try running either Source SDK or model viewer. It should work. Once you've set your resolution, things may appear very small, but you can set it back to normal once you're finished. You may get a "Incorrect input" or something flying around your monitor, try using another resolution that has the same starting number (EG,1024). I don't think many people have this problem on facepunch, but it will come in handy for you Google viewers, i found a lot of forums with people needing help when i was looking through google. I even found some on This forum. If it still does not work. Then I'm stumped. If you are missing the logical viewport, don't worry you can get it back. You can set any of the viewports to it with the registry. 1. If Hammer is running, exit. 2. Open the Run prompt. 5. Locate a key "Visible". It should have a value "0". 7. Run Hammer. The bar should be located in the middle of the Hammer window. VRAD will become unstable and crash at around 1.5GB RAM usage due to the 32Bit program RAM usage limit. I assume you have at least 4GB RAM. A logic_auto Disabling a point_viewcontrol OnMapSpawn without the logic_auto first Enabling it (haven't tried Enabling by other means) crashes the game (EP2). An NPC set as Efficient won't properly playback scripted/choreographed scenes (such as staring off in one direction, won't blink, and won't move on cue). In code, light_environment is derived from light, so it can be given any input light can. The default .fgd files are not complete and lack various entities and properties. The grid size is represented by a signed integer and is not limited to positive power of two values. Only positive numbers will draw correctly. Hammer's grid boundaries can be changed by an .fgd. The engine still retains its hardcoded limits. The Undo/Redo bar is the only toolbar that cannot be toggled/recovered from within Hammer. "mapversion" is defined twice in a .vmf. In CS:S, momentary_rot_button only fires its Position output when it stops rotating. In Hammer, with the Selection Tool, holding down the primary mouse button will cycle through the objects under the mouse. PageUp/PageDown do the same. Named light entities only cast direct lighting. Smoothing groups don't smooth light cast by named light entities; however, they do smooth direct lighting. When encountered by VBSP, positive floating point lightmap scale values are rounded down to the nearest integer. Zero will default to 16. Negative values default to 1. Faces whose material cannot be found by VBSP will not have lightmaps generated and will not be drawn correctly with mat_luxels enabled. Dominic: If you want to check for leaks make sure you compile by putting areaportals into a visgroup and hiding them, otherwise the pointfile will not show the correct destination for the leak. Dominic: If you have a leak that cannot be found via loading pointfile because you have areaportals ruining the pointfile, then in game you can use the command gl_clear and gl_clear_random to set a color that is more noticeable than black. Oh, and I checked out the ent data limit, and it turns out there really isn't one. VBsp is warning you that it's "full" because it's getting close to 384k, which was a size we considered a reasonable amount of ent data. Even though it uses 384k for reporting, it doesn't use that as a limit. It will go ahead and allocate as much memory as you need. Q: Water doesn't show up. It acts like it's there, but is not visible. A: The map probably has a leak. (About Leaks) If not, make sure VVIS and VRAD are run completely. Q: The compile log reports a leak, but it doesn't say what's leaking. Q: What is a leak? Q: In CS:S, I get a "Both teams are full" message and I'm the only player. Q: "MountAppFilesystem() failed: SteamMountAppFilesystem(…)failed with error 21: different version of this FS is already in use." A: Run the game and map manually rather than leaving it to Hammer. Q: "Failed to load the Launcher.dll. The specified module could not be found." A: Try Refreshing SDK Content. If that doesn't work, run the game that the map is for once. If that doesn't fix the problem next compile, run the game and map manually. Q: How can I include custom content in my map? Q: How do I decompile maps so I can learn how other mappers do things? A: Use BspSource. (BspSource) - It's a more updated version of Vmex, it even supports CS:GO! Q: The game crashes while loading the map. A: There could be numerous reasons for this. Displacements, props, env_fire, and func_useableladder seem to be most notable. If the offending object(s) are proving difficult to pin down, use the Cordon Tool to test sections of the map until the offending object is found. Q: How do I change the skybox texture? Q: Some of my textures are flashing/flickering or are black from certain angles. A: Check to see if any of the used textures have "prop" or "model" in the name. 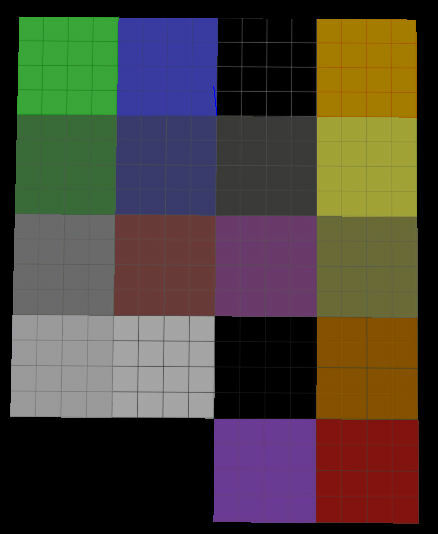 These materials won't function correctly on world brushes, however, they may work on a func_brush. Refraction materials will not work on world brushes and will appear black from every angle. Use the refraction material on the face of a brush entity, such as func_brush, for proper rendering. Q: "No such variable '$hdrbasetexture' for material '…'"
A: VBSP expects an HDR compliant skybox to be used. If one isn't, VBSP will complain. This can generally be ignored. Q: "Can't load skybox file … to build the default cubemap!" 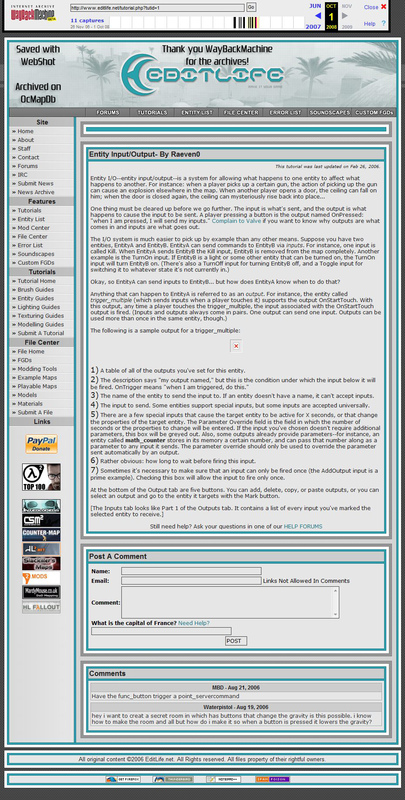 A: This error usually follows VBSP's HDR complaint (above). This can generally be ignored. Q: Some props don't show up in in-game. A: Some props can't function as some prop types. A model made to function as a prop_static might not function as a prop_physics. It can be forced to do so by using the prop_physics_override entity. Check the VBSP section of your compile log for further explanation. Q: How can other game's entities be added to the list of entities? A: Add the game's .fgd file. Tools / Options…Next to "Game Data files", click "Add".Select the desired game file. Q: What are Source's limits? Q: My reflections are messed up. Q: Everything has a purple and black checkerboard tint. Q: The command failed. Windows reported the error: "The system cannot find the file specified." Q: VVIS is taking too long. Q: VVIS is stuck on "9…". Q: Phys maps are broken. A: This is caused by how the new engine handles physics. The only option is to run the map in an old engine game. 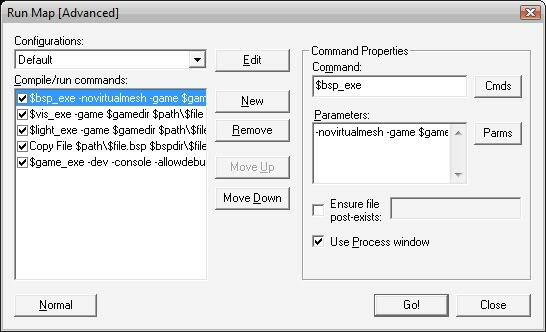 Q: How do I configure Hammer for GMod? A: GMod can run maps from most Source games. Pick the game configuration that is most relevant to your desires. Q: Things fall through displacements. Q: Displacements are not solid. Q: When I try to find a World Model for a prop, Hammer crashes. Q: My Model Browser doesn't work. Tools —> Options…Click on the "General" tab. Uncheck "Use VGUI model browser". Q: When running Hammer, it shows up on the Taskbar and in the processes list, but I can't find the window. Q: When opening the material browser, Hammer stops responding. A: The window is probably opening off-screen. (If you use different/multiple monitors, this can happen.) Right click on Hammer's Taskbar button and select "Move". Use the arrow keys to move the window back onto the monitor. The cursor should relocate itself as close to the window as it can while still remaining on the desktop. Q: In-game, there are dark regions where my displacements intersect. A: This is occasionally caused by running VRAD on Fast. If that is not the case, make sure only the faces of a brush that need to be displacements actually are displacements. Q: The skybox textures are stretched/distorted. A: Add "_hdr" to the end of the skybox name in Hammer. Q: When opening the SDK, the message "No game configurations available" appears. A: On the SDK, click "Reset Game Configurations".Close the SDK. Run the game whose configuration you will be using. Once the game's menu screen has loaded, exit. Run the SDK. Q: "EnumerateApp( 420 ) failed: SteamEnumerateApp(…) failed with error 1: Failed to create key HKEY_CURRENT_USER\Software\Valve\Steam\Beta"
Q: Source SDK stuck at "Validating: 100%". Q: "Cache Needs Repair" or "Cache Needs Decryption"
1. Shutdown Steam by choosing Exit from the Steam task bar icon menu. 3. Run Half-Life: 2 from the Steam Games window. If the problem is not resolved, repeat these steps running Counter-Strike: Source and Half-Life 2: Deathmatch. Q: Faceposer crashes with a "shaderapidx9.dll" error. World Brush - A solid that isn't tied to any entity. Brush Entity - An entity that uses the geometric properties of a brush or group of brushes for a particular effect. Func_detail - A brush entity that acts exactly like a world brush, but isn't handled by VVIS. Point Entity - An entity that exists at a single point. Leak - Occurs when the "inside" of the map is exposed to the "void". Displacements and transparent brushes will not seal the map. Parenting - Attaching one object to another in a hierarchy. Grouping - Turning a selection of objects into a single mass that can moved as one object. Visgroup - Automatic or user defined visibility groups that can be enables and disabled to control what is shown, both in Hammer and after compile. Prefab - A premade setup that can be saved. Lightmap - The luxel grid and density of a brush face defining light resolution. Displacement - A brush face turned into a triangular mesh that can be freely sculpted. Texlight - A texture that is capable of emitting light. Cordon Tools - A simple tool that can aid greatly in pinning down hard to find problems, testing certain parts of a map, or when trying to clear unwanted clutter from the screen. Similar to Visgrouping. LOD - Level of Detail - The quality of a model at different distances. The quality of a texture for different DX levels. Mip Mapping - LOD, for textures. Fullbright- Everything appears at maximum brightness. Cubemaps - Reflections built by env_cubemap entities. HDR - High Dynamic Range (Dynamic Tonemapping) - Used for more realistic lighting effects by virtually mimicking the eye's iris. Soundscape - A set of sounds. Areaportal - An areaportal is a brush entity that can be used to 'seal' separate visleaves and control visibility. Glview - Portal file (.prt) viewer. Vconfig - Sets SDK game configurations. VBSPINFO - Can provide information on a .bsp. splitskybox - Splits a .PFM skybox into its component parts. VBSP - Compiles a .vmf into a .bsp. VVIS - Compiles map rendering and visibility data. Won't run if the map has a leak. Speed is largely based on how optimized the map is. VRAD - Computes the static lighting in the map. Won't perform bounce calculations if VVIS doesn't run. Speed is based on lightmap levels, number of lights, RAM, and CPU. Vtex - Converts .tga to .vtf. VTF2TGA - Converts .vtf to .tga. .vmf - Valve Map File - The file type Hammer uses to save, load, and edit a map. Compiling results in a .bsp. .vmx - A backup .vmf. .bsp - Binary Space Partition - The file type Source uses as a game level. .lmp - Lump - Part of a BSP file. .vtf - Valve Texture Format - Valve's image format. .vmt - Valve Material Type - Defines how the engine should use a .vtf. .fgd - Forge Game Data - Hammer entity reference. .gcf - Game Data File - Mass file collection. Maps, models, textures, etc. are found in this file. .ncf - No Cache File - Like a GCF, but contains no data. .vpk - Successor of GCF and NCF. .pts or .lin - Pointfile - A file created by VBSP when a leak is found. When loaded, a line is drawn from the void to the leaking object. .prt - Portal File - Generated by VBSP and used by VVIS. Can be viewed with Glview. .vbsp - A file handled by VBSP for random placement of detail props and sprites. .rad - Radiosity - A file handled by VRAD defining texlight values. .dem - Recorded demo file (not a video format) or digital elevation model. .nav - Navigation Mesh (CS:S) - Contains Bot navigation information. .ain - Nodegraph - Contains NPC navigation information. .ctx - ICE Encrypted File - Typically used for encrypted scripts. .nut or .nuc- Squirrel script. .pcf - Particle Configuration File - Contains particle information. 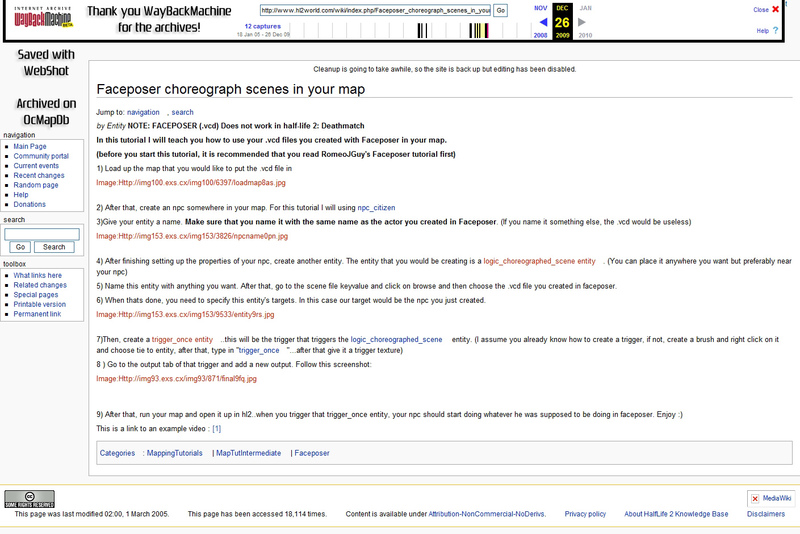 .vcd - Valve Choreography Data - Contains NPC interaction information. .smd - Studiomdl Data - Valve's model source file format. .qc - Quake C - SMD compilation script. .mdl - Model - A model file. .phy - Contains .mdl collision data. .ani - Contains .mdl animation data. 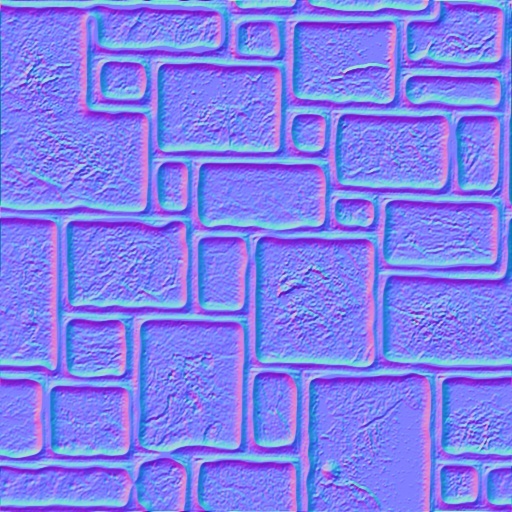 .vvd - Contains .mdl vertex data. .bik - Bink Video - Used for start-up videos. .res - Resource List - Directs the server to push arbitrary files to connecting clients. 2Textured - Large selection of textures, mostly photo based. Bricks'n'Tiles - Textures for roof, brick, floor, glass, sandstone, and others. 3Dref - Slow site because of archive. Wide selection of textures. AccuStudio - Nice selection of medium resolution photo based (mostly) textures. AmazingTextures - A beautiful texture library that has hundreds of free textures to download, high-resolution textures, images, backgrounds, wallpapers and texture maps. Check out their massive collection of Tiled Textures or see their users' Top Textures. Archibase - Huge selection of textures of varying resolutions. ArchiveTextures - Over 3500 free quality textures for download. Ben Cloward - Good selection of photo based textures, with a few high resolution bump/normal/diffuse textures. BoogaHoller - These can be used as 3D model surfaces, backgrounds or to hang on your wall. For seamless textures. CgArena - You can download free textures from CGArena to use in your projects. CgTextures - Wide variety of textures, not tileable. FatStrawberry - Good selection of fabric textures varying resolutions. FilterForge - A lot of seamless textures. GameBanna - Various textures, varying sizes, varying quality. Free3dTextures - A free online resource for high quality, large resolution textures. Free Texture Site - Great selection of free high resolution textures. GameUpdates - Over 1GB of texture packs and collections. Mostly from quake / unreal artists and mappers. Some backups of dead sites. GamingTextures - Paysite, can preview textures in medium quality. 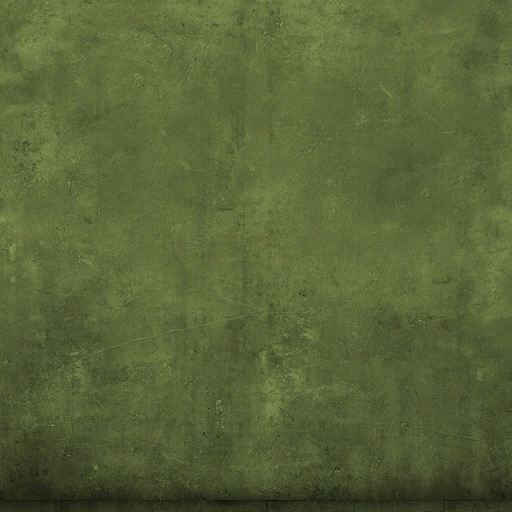 GrungeTextures - Great selection of high resolution photo based textures. JohnSolo - A small amount of textures having nothing to do with each other. Continuum3D - Contains 25+ 360 animated skies, including basic skies, sci-fi, and environmental skies. Lost & Taken - Contains some high resolution photo based textures. Lugher Texture - Good selection of photo based textures of varying resolutions. Mayang - High quality and wide variety. Mega-Tex - High quality brick textures. Noctua Graphics - Good selection of medium to low resolution textures. Pawas - Small collection of textures. PhotoShopTextures - Wide collection of textures. SeamlessTextures - Some more textures. Stock Textures - Good selection of photo based textures of varying quality. StockVault - 2000+ Medium/High quality textures. TextureArchive - Similar to CGTextures. The Texture Barn - Good selection of medium to high resolution photo based textures. Texture Warehouse - Large selection of photo based textures. Varying resolutions. 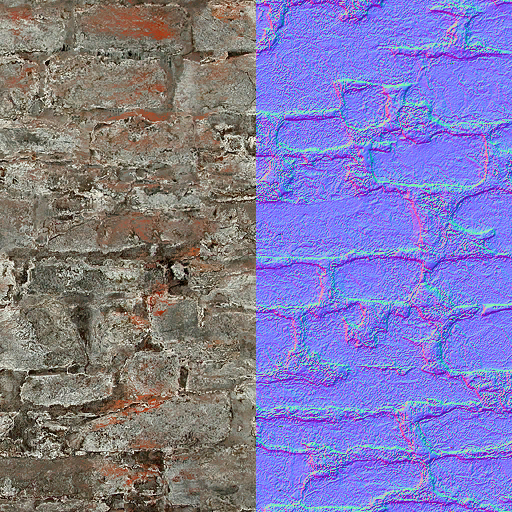 TextureBits - A blog of high resolution photo based textures. 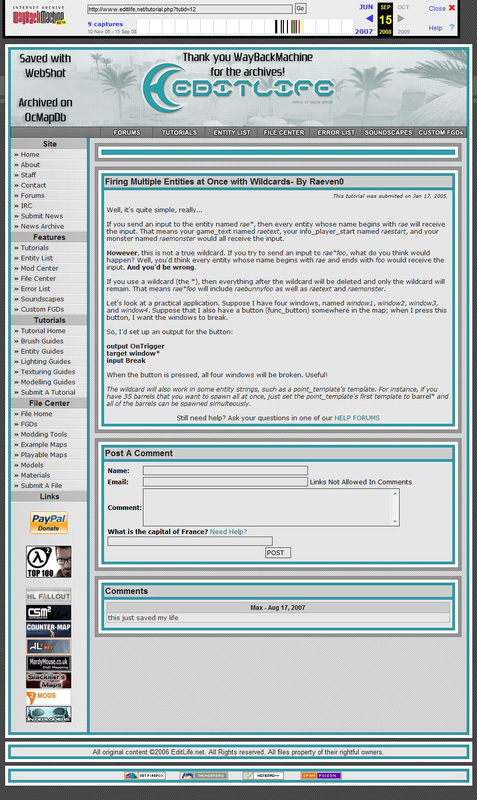 TextureKing - Large selection of photo based textures of varying resolutions. TextureLove - Good selection of photo based textures of varying resolutions. Texturez - Great selection of high resolution photo based textures. UrbanDirty - Large collection of grungy textures. Wiley - A small selection of medium resolution textures. Gaming-Models - Contains over 200 models, textures and untextured. Artist-3D - Small Collection of models. 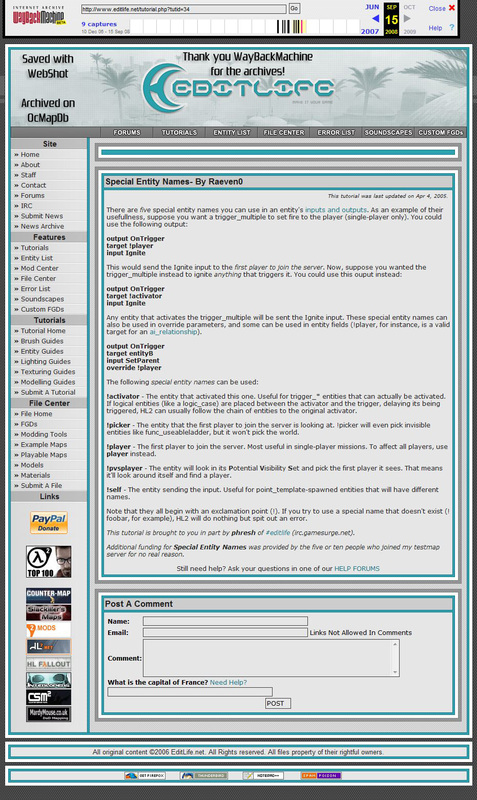 All of those that contributed to the encyclopedia, on the facepunch version and the current version, ALL SITES being used for downloads, with out you there would be no encyclopedia. Please never go down, thank you so much! 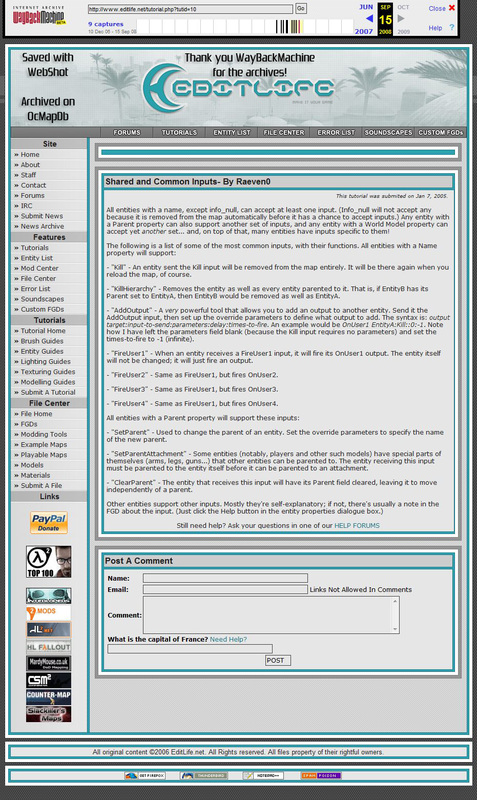 To name a few HalfWit-2, Way Back Machine, Interlopers, Facepunch, I'd also like to thank shutdown websites like EditLife and Hl2World. This page took me a total of two months to put together, the encyclopedia will constantly be updated to ensure links are not dead, and that new content is added for the community. Hopefully The Mapper's Encyclopedia has been useful to you, thanks for visiting! If you would like to contact me to ask me to add something or suggest something for the encyclopedia then please contact me at moc.liamy|xahcinimod#moc.liamy|xahcinimod or on Steam.